The Saskatchewan Genealogical Society (SGS) has recently introduced a program to recognize original settlers and their descendants. The SGS Certificate of Recognition will be presented to descendants of original and/or early pioneers in the districts and territories that make up present day Saskatchewan. 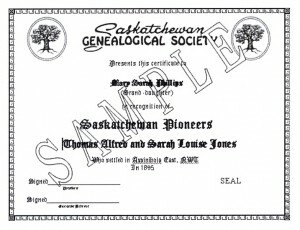 This certificate honours direct descendants of pioneers who lived in the geographical area of what is now known as Saskatchewan. Many of these pioneers have gone unnoticed in history. This project gives us an opportunity to honour them and to preserve more of the history of the people who settled in our province. The Pioneer(s) Certificate will be awarded to a descendant who submits evidence acceptable to SGS of (1) the ancestor’s or couple’s residence in the area and (2) the applicant’s relationship to the ancestor. To recognize pioneers and early residents. Each farmer, artisan, builder, craftsperson, professional person, and store keeper brought us one step closer to the province we are today. To encourage individuals to put together their family history and apply for a certificate of recognition. In addition to receiving the Pioneer(s) Certificate, applicants will be helping to preserve the history of their ancestral pioneers. To add this valuable genealogical information to the SGS collection for use by other researchers. We hope you will join in helping us record and preserve the early human culture of our province. Who qualifies? A qualified pioneer ancestor is a person you can prove to have resided in any part of the territory which comprises of the present day province of Saskatchewan. Who can apply? Applicants need not be residents of Saskatchewan, nor ever lived in the province. After proof of direct descent has been submitted and eligibility has been determined, we will then forward a certificate. Separate certificates will be issued for each ancestor properly submitted. Proof of ancestor’s residency in that time period. Documentation can include birth certificates, census, voter registration, school records, deeds, etc. You may obtain a certificate for yourself or another person (ie. your children, siblings or other relative, but you must be able to connect the lineage. You will not need to send duplicate documents for each application for the same ancestor, just from the new applicant to the original applicant; thus using their lineage to the ancestor. These must be applied for at the time of the original application. The cost is $25.00 for the first certificate and $20 for an additional certificate using the same ancestor. Additional certificates for other family members: if brothers and sisters of the applicant wish a certificate and apply in the same packet the cost will be $20.00 for each additional certificate. Each must be on a separate sheet and prove relationship only to the applicant. If the applicant wishes to provide certificates to children or grandchildren the same situation occurs. Each must be on a separate sheet and with appropriate proof of relationship to the applicant. The cost is $20.00 for each additional certificate. All must be sent together. Upon approval of documentation, the names of the ancestor and the applicant will be printed on a certificate, suitable for framing. All materials submitted as evidence become the property of SGS and will not be returned; do not send original documents. Documents will be placed in the restricted collection unless the applicant opts to have them made available to genealogists and family researchers in the genealogy collection of the SGS Library. A committee of SGS members shall determine certificate eligibility. The committee decision shall be final. Fill out application to the best of your ability. Provide proof of your ancestor’s residence in the North West Territories (Districts of Assiniboia East, Assiniboia West, and the District of Saskatchewan) prior to 1905 or the Province of Saskatchewan after 1905. A document before 1930 is preferred but a document after 1930, referring to an event before 1930, will be considered when supported by other documents. Provide proof of descent from your ancestor. There must be generation to generation documentation from the ancestor to the recipient of the certificate. This documentation should include vital records for the father and mother and for the descending child for each generation. If vital records are not available, other documentation will be considered. Submit clear and legible copies. If the copy is not clear, submit a typed transcript of the pertinent information along with the copy. When citing published sources, include on the document list, the author, title, volume, publisher, publishing date, and page number. If you are citing a source that cannot be photocopied, please provide the name and address of the repository or person who owns the item. A short biographical sketch of your ancestor, including occupation, special stories, and names of family members. A photograph, if available, will enhance the information provided in the application. Some types of records that may be helpful to you in accumulating proof are: vital records (birth, death, marriage, and divorce); newspaper articles (include the name of the newspaper, the date, and page); land, probate, census, tax, and military records; Great Registers (voting lists); Bible records (include a photocopy of page as well as the title page, and information about where the original is located); school and church records; city or rural municipality directories; headstone inscriptions, obituaries, funeral home and cemetery records; immigration, citizenship or naturalization records, as well as other court records. Applicants will have the opportunity to indicate if they wish the information restricted or not restricted. If you choose to not restrict your information it may be used by the Genealogical Society for research purposes. The proceeds from the certificates will be used to further the SGS preservation of Saskatchewan history and promote interest in genealogy.